Fire Protection through the use of automatic sprinkler systems has become a safety standard for over 100 years for all types of construction, including single family homes, multi-residential, commerical, industrial as well as renovations of older buildings. Having the skills to layout, safely install, and supervise, what can add up to miles of piping, takes a person who is detailed, patient, and persistent. As a union sprinklerfitter, you will help save lives! 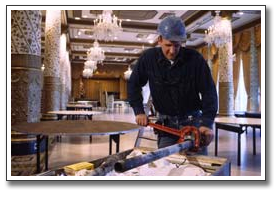 You will be involved in all aspects of the installation of automatic fire protection and suppression equipment. From reading blueprints, unloading the materials, laying out the piping, manipulating plastic, copper, steel, and cast iron piping materials to the final installations, a sprinklerfitter's job can be a challenging and rewarding career.